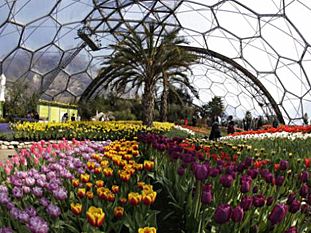 Eden Project is Cornwall’s world class visitor destination for the 21st century opened in Spring of 2001. It has been described as ‘a wonder of the modern world. It is already being called the 8th wonder of the world. 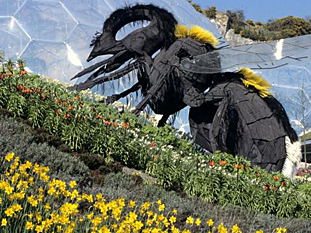 Further planting and the introduction of pollinating insects in late 2001 thus ensuring much more to see at the Eden project in 2002. The Eden Project opened fully on March 17th 2001 with planting continuing right throughout the summer. An unforgettable experience in an epic location, Eden is both an educational resource and environmental showcase; a gateway into the fascinating world of plants and people and a vibrant reminder of how we need each other for our mutual survival. 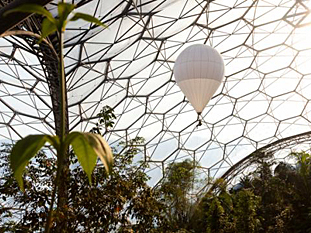 Nestling within a giant 50 metre deep crater overlooking St Austell Bay are two gigantic geodesic conservatories – one is a majestic rainforest cathedral – the other is host to the fruits and flowers of the Mediterranean, South Africa and California. Don’t miss our Rainforest Aerial Walkway – a chance to take to the trees in the largest rainforest in captivity. Go on an extraordinary adventure, enjoy spectacular views across our Biome and learn why rainforests are so important. Outside, in the landscaped grounds, you will find tea and lavender, sunflowers and hemp. Wherever you are in the world you will instantly recognise this spectacular place with its stunning architecture and breathtaking living plant collection as The Eden Project, Cornwall, UK. The Eden Project, just outside St Austell, is well signposted from both the A30 from Exeter and the A391/390 from Plymouth. If you’re coming from outside Cornwall, take the M5 southbound to Exeter, where the motorway splits. Take the A30 and continue until you reach the Innis Downs junction (A391) from which Eden is well signposted.